Thanks OD, found some good stuff on it, mainly Amsoil but I didn't realize it was so different. Anyone else testing their oil? Thank you for this thread! Looking forward to more results. I'm in AZ and my first change on my '04 that I bought in June I used 10-40 Castrol GTX dino. After reading a thread with Olddragger's oil results, I did my next change to 15-40 diesel Rotella, which I'm still running. I'm probably switching to 10-40 Castrol GTX again next until I can do more reading on diesel oil in rotaries. I'm intrigued about the 0-50 synthetic, so I may eventually go that route with a Sohn adaptor. I don't have enough data yet, so that's why I'm so glad to see this thread. 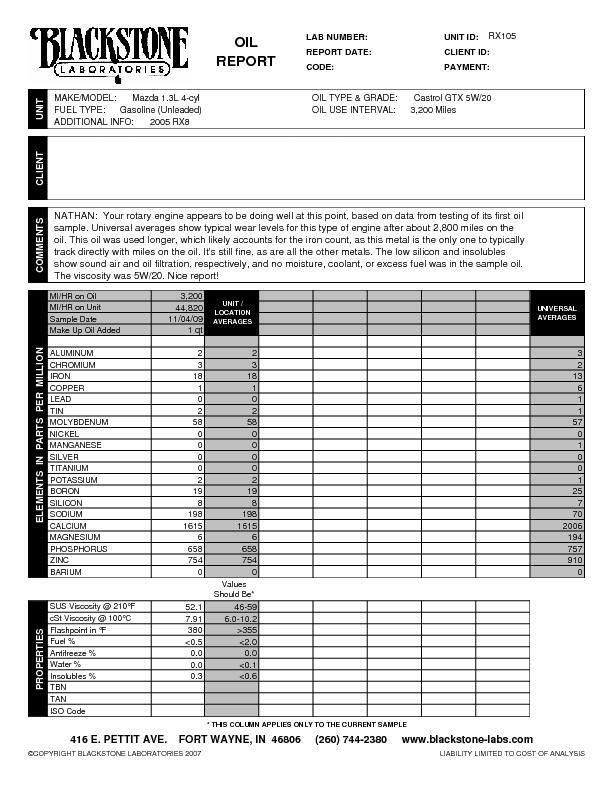 In addition to posting the scans of the results, it would be helpful to post the general ambient temps during the time that the oil was being run, as well as driving style, such as; is the car tracked, how often, daily redline?, octane of gas (which keeps the combustion chamber cooler when higher), etc. No, diesel oil isn't defined by weight, but by the addition of extra detergents, and anti-foam agents. One thing to keep in mind is the ambient temperature the oil is being ran in really doesn't have any importance outside of the minimum pour temperature the oil can handle. By that I mean that the only temperature that matters is the operational temperature of your motor. Now, that can be effected by ambient temps but overall your motor operates at the same standard temperature whether you're in Alaska or Arizona. The thermostat takes care of that. There are some exceptions to this, but by in large your motor's interior environment stays the same. What would be important is if anyone ran their oil at excessive temperatures for part or all of it's life. That would be consistant with tracking the vehicle typically. would it be relevent to include what air filtration set up you have? After reading a lot about air filtration I switched back to a WIX paper filter. The above UOA was while I was running my K&N. I have noticed no difference in terms of performance with the WIX and the filtration is better than the K&N. My latest Oil Analysis. It's my car from new and has had oil changes with Castrol GTX 5W20 every 3000 miles + or - 300. This was my last change running this oil. I've switched to Amsoil 10W40 with two changes to get as much of the old stuff out as I could without tearing the car apart. We'll see how this plays out. 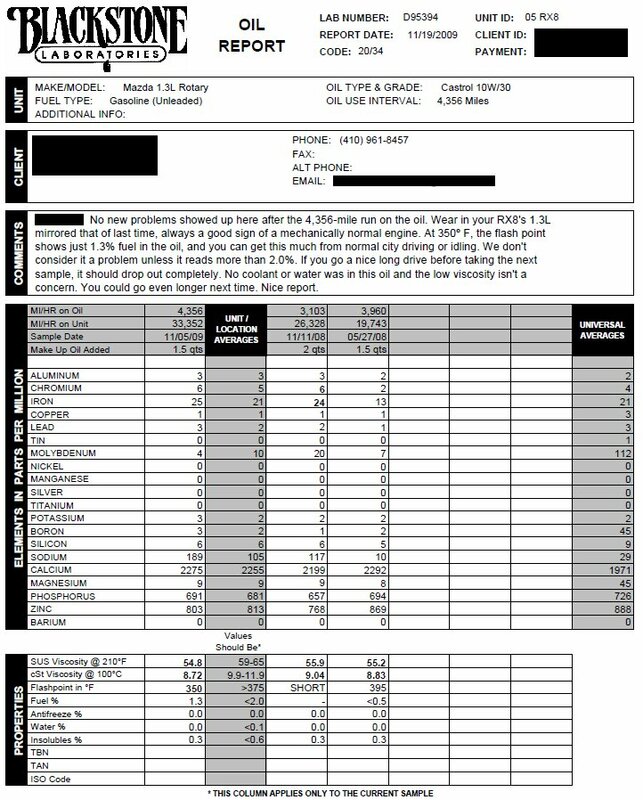 So far no leaks or issues from switching to synthetic, although I wouldn't think it to be an issue with 44k miles. I also premix with Idemitsu. Purolator PurOne oil filters used since first oil change after brand new. Thanks for the info!! Why the drastic switch if everything looks good? After seeing several failed engine teardowns and as I learn more and more about this engine, I decided to switch to a 10W40. I don't track my car, and don't plan on any MAJOR performance upgrades. Just spirited enthusiast driving. My interests lie in longevity, and I feel the switch will prolong the first of engine rebuilds for me. I really enjoy this car and don't see myself getting rid of it (not my daily driver), in fact it's opened the door for me into the rotary world which I'd like to pursue as a hobby. Not for racing so much, but for restoration and collecting. As for Amsoil, I've seen several occasions of religious use of their motor oil from day 1 brand new engines that are now 20 years old (or more) with amazing results. The RX was my first brand new car I bought and I wish at the time I knew all I've learned about rotary's over the past few years..I would've used this oil then. I definitely don't mind paying a little more for a quality oil. Plus the company was started by a fighter pilot, how can you argue with that conclusive piece of scientific data!? No doubt Amsoil is a great product. And my apologies I don't have a more precise reasoning behind it like you're looking for with this thread. I figure we all cant be experts at everything all the time always:-) When checking through oil data sheets I just know what numbers are supposed to be high, which are supposed to be low, and compare them with others...couldnt tell you exactly what they mean or fully understand them. All I can do is contribute what i know and put it out there for others to form their own conclusions. As much as the CONSTRUCTIVE posters in this forum have taught me about this hobby, its the least I can do. I'm very interested to see as more people post their test results in the future. Next one for me maybe later than sooner seeing how the RX is sadly about to go into winter storage. Most of the time constant discussion leads to a bit of education. Thanks. Checking through all the other sheets I am starting to be curious about my sodium level. Mine's WAY higher than the highest I've seen on here so far, which makes me wonder about possibly having a coolant leak. The Antifreeze % = 0 though. we'll see what kind of values I get next oil change. Wow, look at your sodium compared to mine. You should call them and see what they say. This service is turning out to be even cooler! I just got off the phone with the lab and after I asked why my engine is showing much more sodium than my peers with the same engine, he said Castrol GTX uses more sodium in their additive, along with...I think he said Valvoline. He then compared my results with others with the same engine running the SAME oil, and have similar higher levels of sodium. He was saying he can go in and compare results using a whole bunch of different parameters. If it were coolant, levels of other things like potassium would be higher as well. This is definitely a neat service! That much more sodium? I ran nothing but Castrol GTX 10W-30 in my second engine (Lasted 72,000) but I never had a UOA done. It's a very good oil but I should have done double changes every other oil change and had a UOA done. Here's my latest report. I got the car at 15,000 miles so I can't speak to what oil was used before then. Note I don't get every change tested. Depends on whether I remember to have the sample bottle ready. There was one done before this one at about a 2500-mile interval. Went for a longer change interval on this one than I intended, but appears to be no ill effects. Blackstone loves to keep pushing me to longer change intervals. I don't idle the car and I don't do city driving, so the fuel level is something to watch. Good report for a non synthetic, my second engine lasted 73k with Castrol GTX 10W-30 but no premix. It's a good oil but that viscosity is not so great IMO. My GC was 9.2 and that was bad, it should be at 10.5 or higher from what I have seen. I wouldn't go longer. I did my single oil cooler install the weekend and when I drained the oil I forgot to get a sample so now I will wait again until the next one. Since I did the cooler install I got ever last drip of oil out and switched to Mobil1 0W-40. Last edited by 9krpmrx8; 11-25-2009 at 02:31 PM. Good report for a non synthetic, my second engine lasted 73k with Castrol GTX 10W-30 but no premix. But why did your engine fail? What broke? It's a good oil but that viscosity is not so great IMO. My GC was 9.2 and that was bad, it should be at 10.5 or higher from what I have seen. I wouldn't go longer. Note that it's still higher than the factory-spec 5W20. Mazda is warranting the engine for 100,000 miles, so unless they expect to replace every 2004-8 engine at least once it can't be that bad, can it? Start at post 21 if you want the background. I am on my third engine, all replaced under the 100k warranty. The first failed at 22k, the second at 96k (close call). Since they were replaced under warranty I never got to see why they failed. But seeing has I never skimped on oil changes I will count the first one up to the faulty OMP rate in the first flash combined with crappy 5W-20 in 100F+ weather here in south Texas. I believe the second one lasted due to the use of the better Castrol GTX 10W-30 but eventually died due to the lack of lubrication on the center of the apex seal because I did not premix until the end. I didn't mean that the viscosity was bad with your Castrol GTX just that the higher the better in terms of protection under load. I do believe we can use a decent Dino oil but it will have to be changed more often and gives less room for error. I use synthetic because I am using the SOHN adapter to inject clean premix so my engine is not burning motor oil. I am also premixing the gas with Lucas UCL so I think this motor should see 100k without issue despite the punishing track days. As far as the engine warranty, well, they don't expect to replace every one but they have replaced a huge percentage of the motors. Honestly the motor is just flawed by design due to the missing oil injector and a separate reservoir to inject clean premix. But I do understand that an average owner is not going to premix gas let alone add premix to a separate reservoir. Oh, and I just removed my factory dual coolers and replaced them with a large single Fluidyne unit and an Oil cooler thermostat because I believe oil temps and lower oil pressures (huge increase in the 09's) are a major issue as well. Last edited by 9krpmrx8; 11-25-2009 at 05:33 PM. You know it still blows me away why people talk about oil. Correct me if I'm wrong however the demise of normal engine operation is not oil related---it's carbon buildup related with the apex seals and springs. Carbon buildup from the crappy stock oil injection. Disconnect the pump and add 1 oz/gallon and you're good to go. Another thing that I'm perplexed about---all this oil analysis. I thought the rationale behind the analysis (from drag and high hp motor markets----at least what they do here in Indy) is to examine the metal content and determine where the metal is coming from (bearing, rings, other). From there you pull apart the motor and make improvements. Nobody seams to be doing this. Is this a warm fuzzy thread? Apologies for being direct but what are we trying to learn here? I'd say some of us are hunting for the best way to ensure our engines last the longest in whatever our respective uses are (autox, street, turbo'd..etc.). Its apparent with premix or SOHN adapter or not that the recommended 5w20 just doesn't cut it. Its interesting to see just exactly how the oils held up over whatever mileage someone has posted with their analysis, and helps in deciding what oils may or may not be better for this engine. You're right in that the major fault in this engine is oil delivery, however not so much carbon build up but from wear from poor lubrication. All the pre-2009 engines are having oil directly delivered to the outer area of the apex seals, and not the middle, for an example. I think our consensus here is to find out what set up best equates to promoting longevity of these engines before failure; This particular thread dealing with oil. The different oil analysis being posted don't only show metals and minerals, but also viscosities and flashpoints after normal usage. Last edited by N8theGr8; 12-22-2009 at 10:44 PM. What is the agreed upon hypothesis on what "wear from poor lubrication" is? Rotor housing wear? Seal wear? Other? That would be an area you could get a lot of info on from the Mazmart (and other) engine autopsy threads. I know that they have seen excessive eccentric shaft bearing wear in a lot of engines. I'm not sure what their stance is on the longevity of stationary gears and other non-seal internals. Even if it's an apex that blows your engine, you'd hope to be able to reuse as much of the internals (minus seals/rings/gaskets) as possible. Oil injection/premix/anything in the intake track is one issue. The performance of the oil that is cooling the engine and lubricating the internals is another. If one were to nail down the premix fluid and quantity to a fine science only to see eccentric bearing failure, you wouldn't have netted much of a result. Really, this thread isn't about apex seal wear or injected oil/premix at all. My purpose is to just to see how different oil are performing in different Renesis engines in different environments. I also realize that these tests can be somewhat unreliable but when doing them regularly I think you get a basic picture of what is going on. For me the GC 0W-30 was highly taught-ed yet did not perform so well for me. I am patiently awaiting my report of my Mobil1 0W-40.